I recently hatched a plan to start collecting environmental portraits of key volunteers and staff at Pajartito; Milt easily made the top of a heavily populated list. I imagined Milt posed next to the ski run sign, beaming with pride and beautifully spaced green trees lined up behind him. Well, the Las Conchas fire played the role of set designer, and charred the entire area around Milt’s namesake run. Now I was left with a new challenge: how to capture Milt, next to the remnants of his run. Well, I had plenty of time now to formulate a plan. Three weeks after the onset of the fire, I finally had access to the ski area. Up to that point, the fire department was only letting select staff on to the mountain, due to reoccurring flare-up around the area. Since access was restricted, most people (like me) saw the burned areas through snapshots taken by ski area staff while they inspected the mountain and surveyed the damage. Luckily, some of those initial images help provided invaluable reconnaissance info of the photo shoot area, but didn’t prepare me for what I’d see while driving up the ski hill that first day. Black sticks jutted out of a dark black carpet, covering the slopes and canyons flanking the boundaries of the ski area. The air filled with the smell of char and heat, and ironically, wet ash due to a thunderstorm that just passed through the area. Luckily, the main area of the mountain was spared. So upon entering the parking lot, I was greeted by both Milt and a view of healthy trees everywhere I could see. While the landscape appeared encouraging, you couldn’t escape the burn smell hanging in the air. Milt and I piled into the Jeep and started up one of the mountain’s cat tracks, working our way from green trees to the western burn areas. The shoot location was just off the road, and at the start of Milt’s meadow. The shot layout was pretty basic. I wanted to capture Milt in an optimistic, bordering on defiant, stance, surrounded by the remnants of the fire. What better image, than showing him at work restoring his slope. 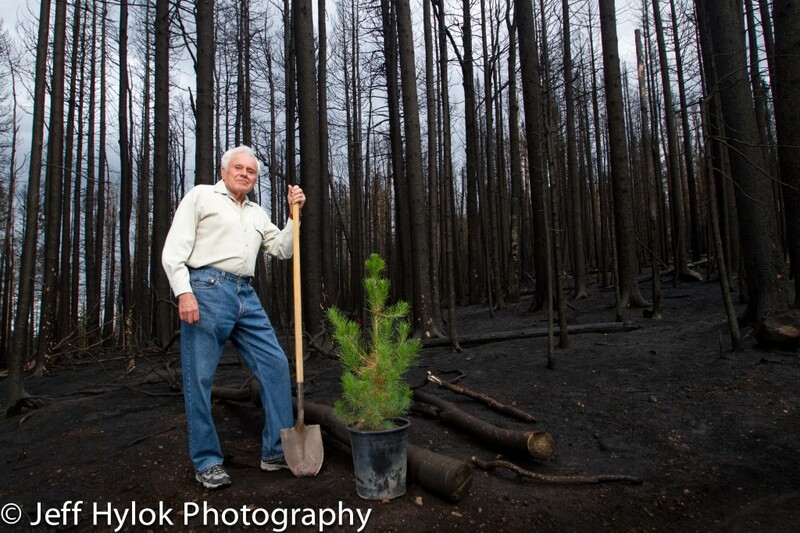 I brought the tree and shovel; the first worked great for contrast, and the second gave something for Milt to hold while posing. Luckily, Milt happened to wear an off-white shirt, which also provided great contrast to the charred trees (which were an incredibly deep black due to the rain that afternoon). The lighting also proved to be pretty simple. The sky was mostly overcast, producing great diffuse light. All I needed to do is add some pop on Milt with a softbox high camera left, and a speedlite adding some kick on the tree. It didn’t take much light, given the color of Milt’s shirt, and the great green color in the tree. After everything was all in place, I relaxed, carried-on a great conversation with Milt, and captured several dozen images before rain started to settle in again. It ended up being a great shoot, but filled with mixed emotions. The damage to the hill and surround area was tough to see, but I spent the time talking with a guy who already helped the area recover from one fire, and couldn’t wait to get on that bulldozer and start rebuilding a second time.